Wellington is New Zealand’s culturally diverse and vibrant capital city, situated at the south-westernmost tip of the North Island, and a must-see destination for anyone looking to explore the best of what NZ has to offer. Renowned for its bustling urban downtown, Wellington also offers easy access to a wide array of adventure and leisure activities slightly further afield. Take the family to see wildlife at Wellington Zoo, Zealandia Sanctuary or Staglands Wildlife Reserve, or take a guided food tour, electric bike tour or private sailing charter to see more of this delightful city. 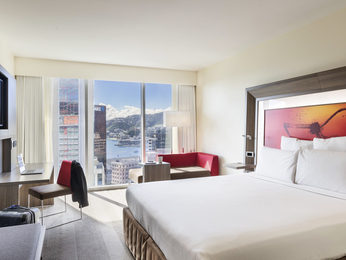 Located in the heart of the CBD – close to iconic attractions such as Te Papa, the Cable Car, and the Botanical Gardens – Hotel Novotel Wellington offers exceptional Wellington accommodation in the centre of the city’s shopping district. Treat yourself to some retail therapy, take a stroll around the Wellington waterfront, visit the Beehive or the National War Memorial, or get a unique look into some of the world's favourite movies at Weta Cave mini-museum.